Okay…so this was a different type of year, 2017. It was good in some ways, and totally awful in others. I can tell you with absolute honesty that I was totally delighted to see 2017 “go.” I celebrated the New Year with a nice, delightful bunch of people (above), and it was oh….so…..great. People caring about people…none of us with perfect lives. I learned that I am stronger than ever. I learned that I have some of the best friends imaginable in my life. Anyone would be the luckiest person in the world to have my friends, but that gift has been given to me. I am grateful. I learned that in the midst of everything going horribly, I am not alone. 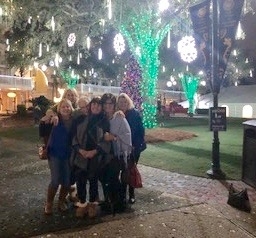 I learned that friends step in to make the present moment incredibly better and they also do everything in their might to make the future “work”…even to the point of inconveniencing themselves and dropping everything to assist with Earlene’s life. I realized that angels are very real…they walk, talk, speak, and offer the most unimaginable grace. It really is true….even in the worst of circumstances, there are still good decisions to be made. The benefits in “thoughts and prayers” really have to do with finding enough strength to keep one foot in front of the other. In caregiving, that might be the greatest gift of all. Satisfaction in honoring another as they chose to be remembered might be the greatest joy to be experienced in loss. Gratitude and “no regrets” in realizing every moment was lived to the fullest is probably the most satisfying feeling of all in the healing process. For every circumstance that occurs in a horrible experience, there are good people somewhere in the world who are delighted to assist in making it better. As I began to think about all the ways that 2017 was an awful year, I began to list things, but stopped in my tracks. Why go back? Why re-hash all of the bad stuff? Why go there again and again? Life is difficult. From my experience, that is a true statement. “Life” has never gotten an easy “sell” as a perfect, sweet, “all is well” kind of deal. Life is difficult…go on. Get through all the bad stuff…head to the good stuff…show gratitude along the way…call on the spiritual powers of the universe to walk with you and assist in direction…do the best you can to live an intentional life of joy. Remember the ones you loved with gratitude. The truth is that I could have written at least 100 more “good thoughts” above as compared with one bad one. I think I realized the truth about the joy of one’s life. It really matters how we spend the time we have on this earth. It matters deeply. There are no “re-do” buttons on life. We get one chance….one chance to be all we can be and live life to the fullest with others. Nope…not going back. As my husband said a few days before he passed, “It’s been a good ride.” We all must make that “good ride” happen in our lives. So…you take the bad with the good. You follow “gut instincts,” “wise counsel,” “information gleaned from research,” and any other thing in the whole-wide-world that will help you get through the bad times. At the end of the day, we realize that no matter what we endure, as John R. Claypool, IV said in many, many sermons, “Life is gift.” We aren’t assured of tomorrow, but what a gift to wake up in the morning, and know it has “happened.” Life is really, really precious. So…in the midst of all that is perfect and all that isn’t…Happy New Year! Welcome 2018!! Previous Post: Where’s the Merry??? LexGals! !